As more and more publishers have started to offer open access institutional memberships we have started to struggle with the effective management of the various schemes. We are currently signed up to 12 active deals and are scoping half a dozen more. All of the memberships are at different stages of maturity leading to a fairly complex situation if you are trying to stay on top of things. Currently this work is all carried out by one member of the Scholarly Communications Team; however, we are trying to move towards a more transparent decision making and management process which is available to the whole team and other associated staff members. After reading an interesting post about the use of Trello within Libraries we decided to try out this project management tool for managing our open access membership schemes. I won’t go into detail about about Trello, as this is covered by the blog post linked above, but I will talk about how we are using the tool for this specific purpose. Each project you wish to manage with Trello gets assigned it’s own board which you can keep private to an individual or share with a team. In the screenshot above you can see that I have 3 private boards and am sharing 2 boards with the Scholarly Communications Team. Looking in more detail at the OA Prepay membership board (screenshot below) you can see that we have created 4 vertical columns, known as lists, each populated with a number of cards. You can assign tasks to cards, but in this case we have chosen to allocate them to publishers membership deals. If you want to you can even assign cards to be monitored by specific people within the team, but we have not yet opted to do this. The lists are a way to keep the cards organised – for example each list could represent a workflow step. If you like the ‘Getting Things Done‘ methodology you could have To Do, Doing and Done lists. Each new potential open access membership deal would be given a new card (see below for an example). The card is firstly populated with a brief description of the membership. 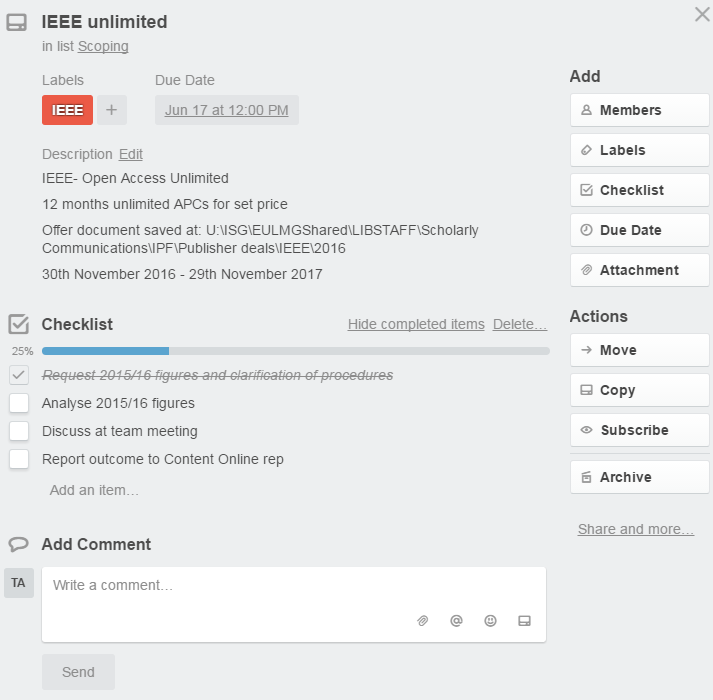 We then add a Label (to enable filtering by publisher), a Checklist of to-do items, and a Due Date when a decision is needed. It is possible to add attachments to the card, for example the offer documents or contracts, but we have decided not to do this. Instead we show the file path where the documents are saved on shared network drives accessible only to the team. We don’t trust giving a third party our business documents in case of a data breach. Once the checklist items have been worked through, if successful and the membership was activated, the card would move over right to the Current Membership list. If unsuccessful we would place at the bottom of the Scoping list with a sticker indicating this (a big red thumbs down). Once on the Current memberships list (2) the cards are ordered by dates, with the membership deals that are ending first placed at the top. Any member of the Scholarly Communications Team can then see which deals are active, when the membership runs out, find out details of the deal including costs, sales rep contact details and links to other documentation. This is preferable to having all the membership knowledge retained by one member of the team. Towards the end of the membership period the cards are moved over to the Action Required list (3) to indicate that a renewal or deactivation decision is needed to be made. If renewed the card is placed back into the Current Memberships list with details updated and the Due Date reset (4). If the renewal is rejected then the card is passed right to the Dropped Membership list (5), with the decision details recorded so they can be revisited at a later date if the renewal is questioned. 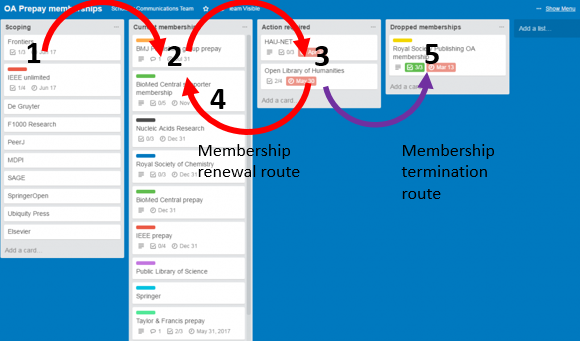 In summary, the workflow we present here might not work for every institution however we have found Trello to be a very useful tool to manage the process of managing open access membership schemes within a team setting. It’s main benefits are that it is highly visual and thus easy to use with minimal training, very adaptable to fit different circumstances and the basic version is free. As of 31st March there are approximately 76,800 records in our Current Research Information System (PURE), of which 16,795 have open access documents available to the general public (22% open access). In addition there are 170 records with documents waiting for validation. 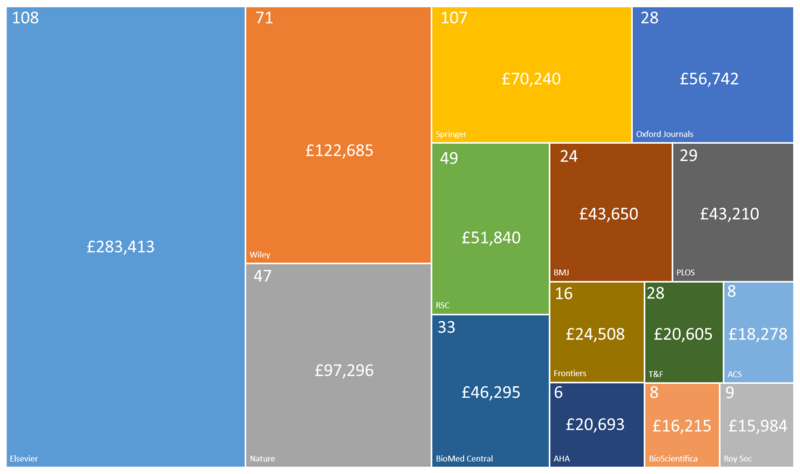 Status of the RCUK fund – currently there is £367,400 left in the fund*, with an additional £74,400 committed on articles submitted for publication. Altogether the fund has 35% left in the account. As of 27th Jan there are approximately 75,700 records in our Current Research Information System (PURE), of which 15,486 have open access documents available to the general public (20% open access). In addition there are 71 records with documents waiting for validation. Status of the RCUK fund – currently there is £327,222 left in the fund, with an additional £65,011 committed on articles submitted for publication. Altogether the fund has 39% left in the account. The Digital Library team at the University of Edinburgh have written a new paper analysing the cost of Gold OA over the past few years. 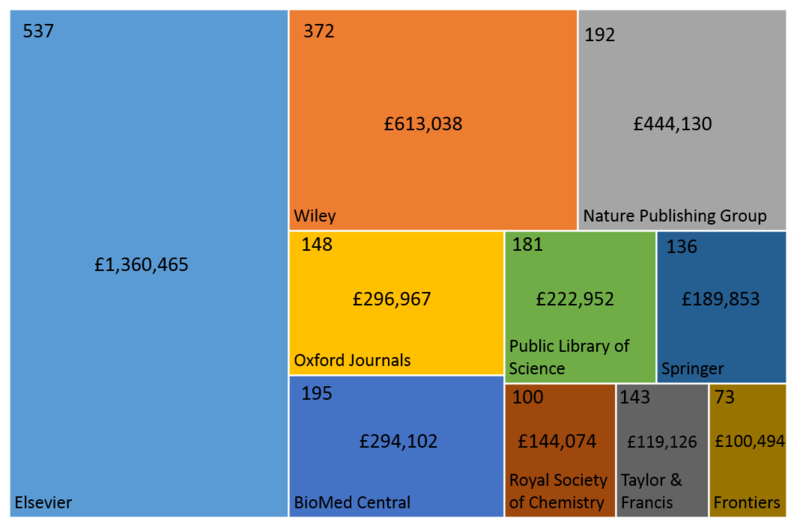 The data arises from managing the Wellcome Trust’s Open Access grant awarded to the university. There is a positive correlation between APC cost and impact factor for both hybrid and full OA journals. It appears that Open Access policies require rigorous compliance monitoring to be successful, and seem to be more effective when punitive sanctions are imposed. Research-intensive institutions are likely to be hit by a cost ‘double whammy’; they not only publish more articles, but they also publish them more frequently in high-impact-factor journals. Institutions need to be more open about costs, and publish the data in a format that allows reuse.